Get out into nature and away from the pressures of daily living. 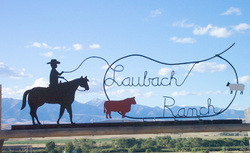 Spend a few days at the Laubach Ranch, a working ranch located on superb trout waters. The ranch land that is owned, leased and operated by father and sons, includes almost 3000 spectacular acres with two miles of private access to a secluded stretch of the Yellowstone River just six miles west of historic Big Timber, Montana. For many, this private fishing experience is what will keep you coming back year after year. (Fishing opportunities are at their peak in September and October, a glorious time to be in the Rockies.) For others, the opportunity to participate in the favorite ranch activities of this family owned and family operated ranch will be more inviting than the fishing. Or perhaps non-fishermen can send their family members to the river and enjoy the working ranch activities guilt free! Any time of day we recommend that you step out of the ranch house and walk 5 minutes along the path to a two-mile stretch of ranch-owned river frontage along the Yellowstone River. Just upstream from the ranch is the fishing access named Grey Bear by members of Clark's Corp. of Discovery. Six miles away is the site Clark called ""Rivers Across"" where Big Timber Creek and the Boulder River flow into the Yellowstone River. Keep your cameras handy so you can capture the large flocks of ducks or record the geese nesting or deer grazing. Regardless of your level of skill or aptitude for fishing or interest in history, you'll have a wonderful time. Ranch activities include daily chores such as tending to the cattle with Jake the cow dog trailing along behind. Depending on the season, you can be part of the calving, ride herd, drive cattle, or help with branding. Haying and all that goes with it are in full swing in the summer. In the fall you may enjoy goose hunting or there is always deer hunting. Mid-October is the time of the Northern International Livestock Exposition and you might enjoy attending as guests of the Laubach family. Laubach Red Angus cattle work hard to place well in this show. Experience the traditions and the heritage of this working ranch vacation. Choose from the accommodations of the guest bedroom right in the ranch house or the mobile bunkhouse nestled in the trees near the Yellowstone River. Family style meals are memorable occasions when Donna is the cook. Meal times are a good time for visiting and learning about the history of the ranch and the history of the area. Ask to see the Indian artifacts and to visit the tipi rings located nearby. Cabin rentals $100 per night for 2-4 people. This is an option independent of the working ranch vacation or it may be used as part of the three-day stay to complete the vacation. (Available in summer and early fall.) A great opportunity to unwind, recharge and gain perspective. Meals available for additional $35 per person per day. Directions: Located on the Yellowstone River just six miles west of Big Timber, Montana.